Are you in education business? You must be having admission time slot for your college. 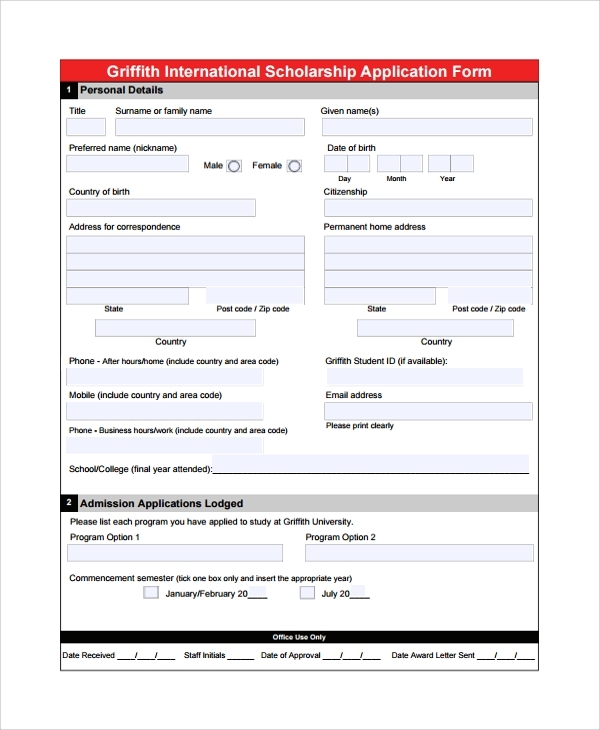 Or if you are running any kind of online portal for admission and courses from different colleges, you will definitely require these free scholarships application form. Preparing sample scholarship is not easy, there are various vital components which are to be remembered while preparing sample application for Scholarship Forms. To make your work easier we are here providing you various sample templates. In school level, institutions provide scholarships for students who are financially weak but have excellent merit or there are also some reservation or provision for people who belong to any minority community. 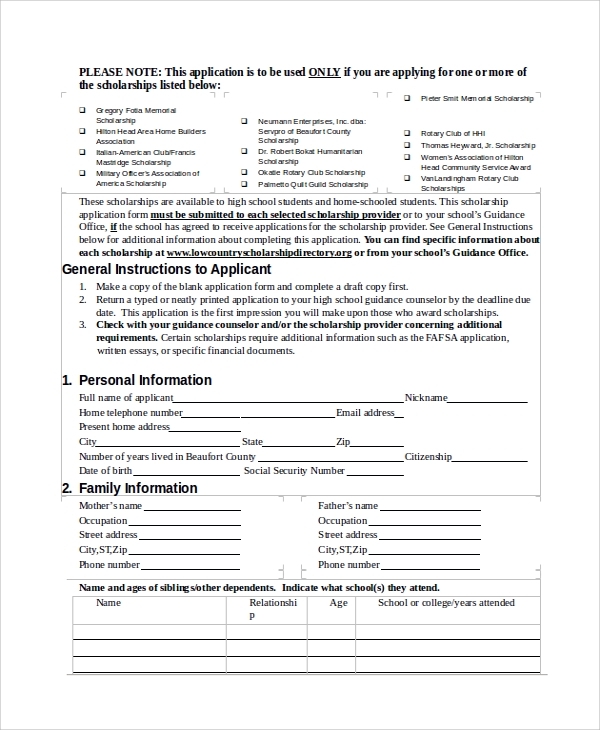 Scholarship Application form for school has all the information regarding the student and their details, their last school grade, etc. In college level, colleges and institutions provide scholarships for students for people who are from minority family background or from below poverty level but are excellent in studies. These students are supported and get admission through scholarship. 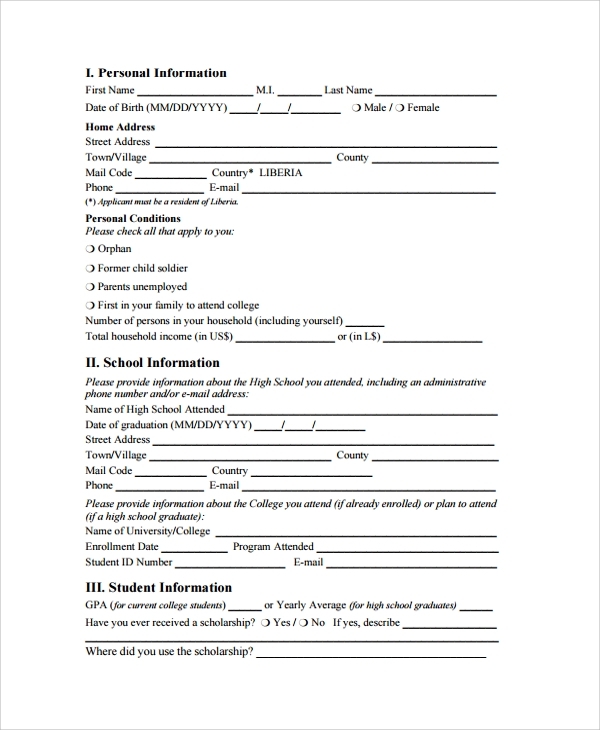 To get their true details and to shortlist them you must require these type scholarship template for the college level. 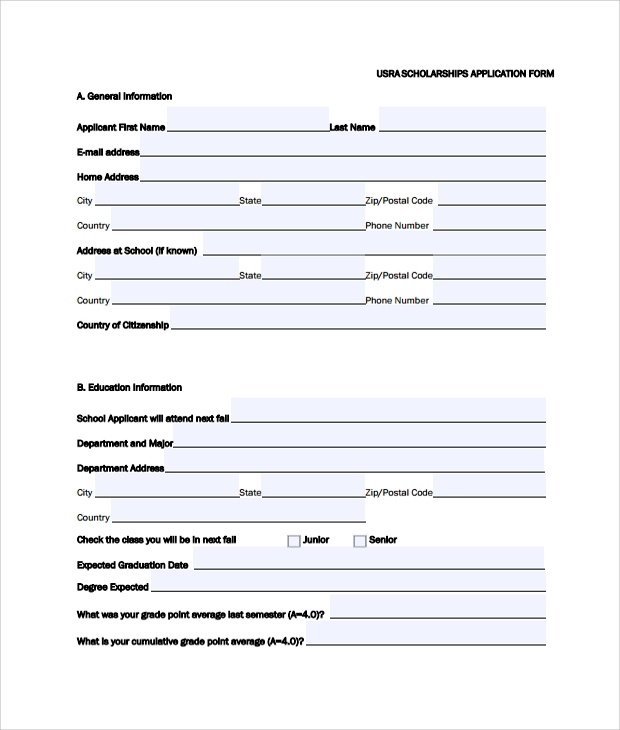 For any special education or any other course through an online portal or for university this scholarship application will help innumerable students to take admission and apply through the online portal under scholarship advantage. The students who are from poor financial background or from backward class can get admission through this process. 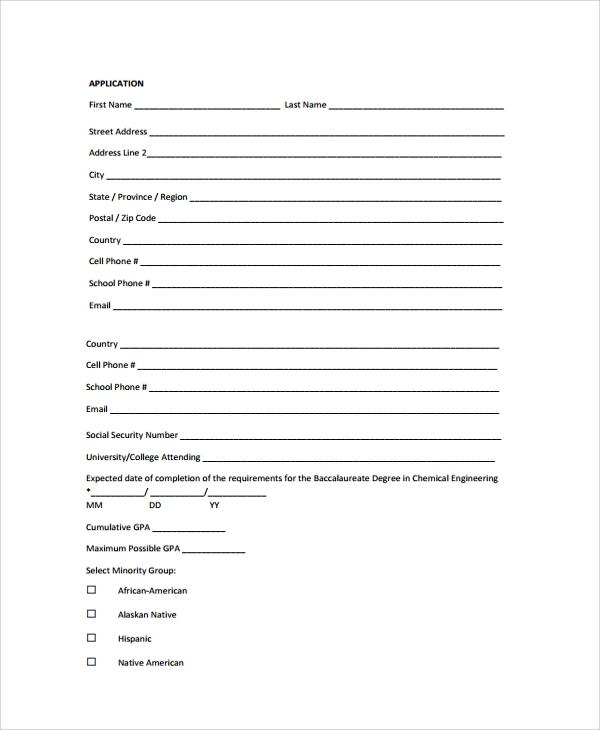 Using the sample scholarship template is extremely easy. You can download the suitable form as per the stream or division you are opening the admission for. Edit the columns as per your requirement and it will ready for use. 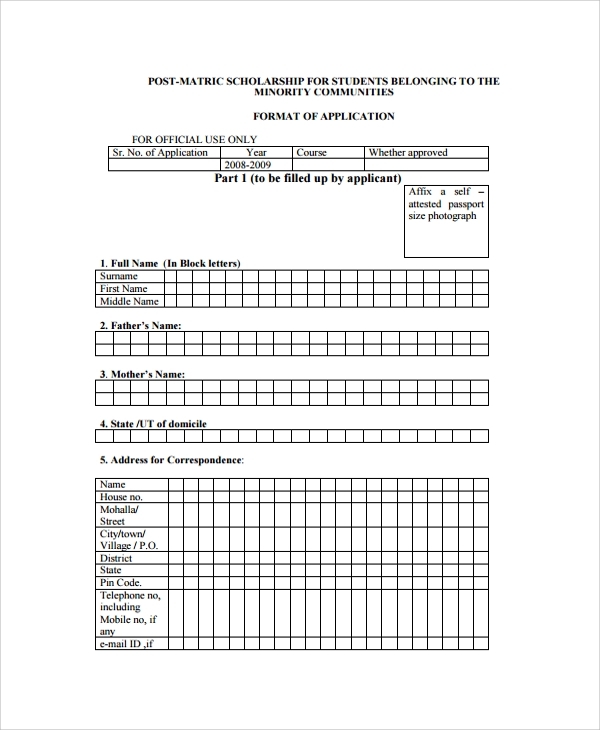 If you are running an online portal then you can definitely attach this form to your portal where the students can download and fill it. When do I need Scholarship Application Form? Personal information column must be there, which will definitely provide all the general information of the applicant such as name, address, contact details, parents’ details, location and mark list. Institutes also demand for writing an essay for themselves mentioning the reason for desire of scholarship and the subject the person is interested for. It also includes the further details of the candidate so that institution can validate the candidate and his/her skills. 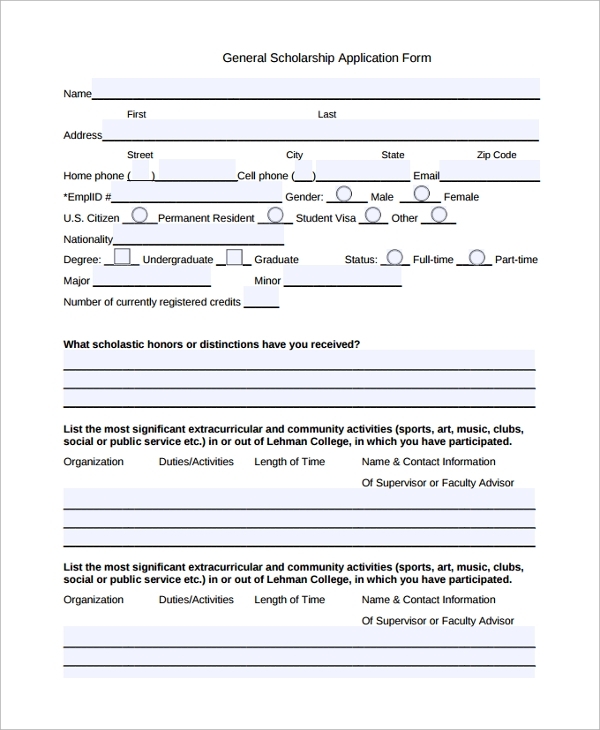 Every college or institute which provide scholarship are always in need of such forms. We have all templates available both in word and PDF and are 100 percent customizable. These are compatible for lower and upper version. You can use each template as per your requirement. 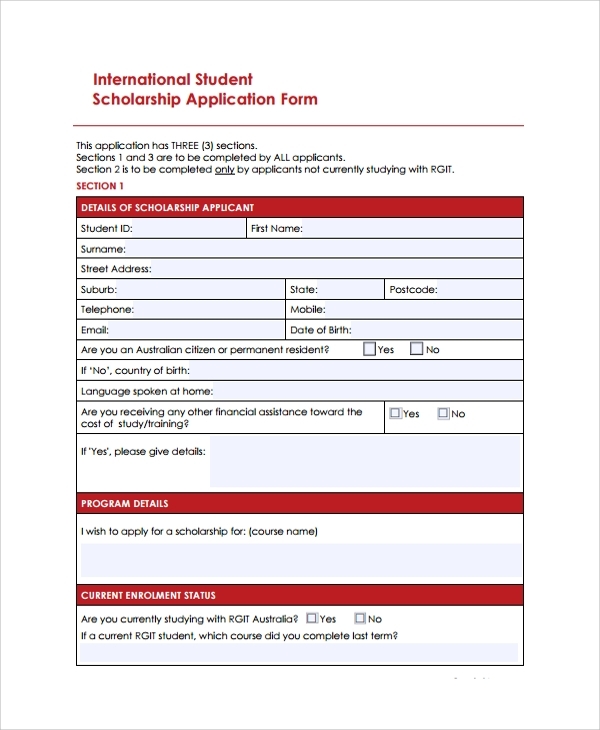 Here at our site we have provided various free templates for scholarship admission form, please go ahead and download the best suitable application form for your portal or institute!